Instructions: Create a card base 7 x 5.5 inches in white cardstock. Cut a slightly smaller piece of purple cardstock, top with a slightly smaller piece of blue paper from the Buttons and Blooms Paper Collection and cut a piece slightly smaller than that from the yellow and blue paper. Cut the top of the yellow and blue piece off with the Fleur Border Basics Die and cut out the scalloped border from the same set in white cardstock. Adhere the scalloped edge to the top of the yellow piece and adhere all the layers, leaving the yellow piece open on the top as a pocket. Cut out two of the lacey corners from the Album Tags and Accents Die and adhere one to each corner as shown in photo. Stamp buttons from the Buttons and Blooms set in black, cut out with coordinating dies and sponge with Black Cherry inks. Cut out extra buttons with the Buttons and Blooms Die and glue multiple layers together to give the buttons a realistic thickness. Sponge the sides with ink and cover the buttons with 3D Crystal Lacquer. To create the flowers, stamp the Botanical Roses in Black Cherry and sponge the centers with Bamboo Leaves and the rest with Black Cherry, cut out with corresponding dies and sponge edges with same. 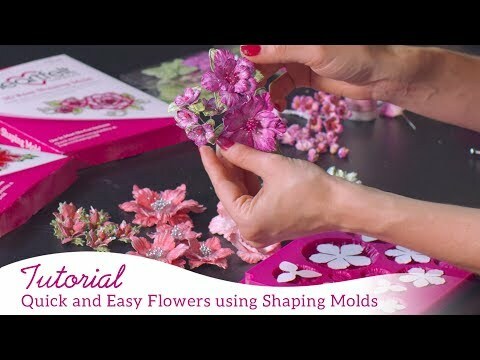 Sculpt with the 3D Floral Shaping Mold. Add Crystal Clear glitter. 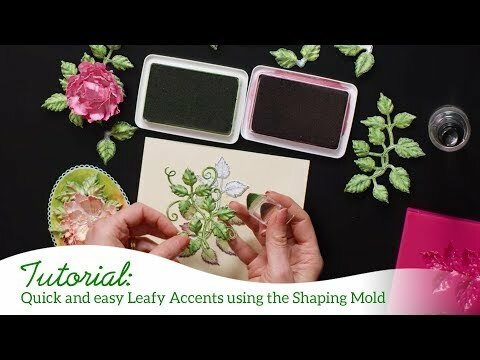 Stamp, and sponge leaves from the Leafy Accents set in Bamboo Leaves, cut out with corresponding dies and sculpt with the 3D Leafy Accents Shaping Mold. Stamp the pocket from the Patchwork Pockets and Patterns set in Danube Blue, cut out with coordinating die and sponge with same ink. Adhere the pocket on the left side with foam dots and add a large button. Cut out the With Love sentiment tag from the paper collection with the Tickets and Tags Die, cut out the blue tag with flowers from the paper collection with the Ornamental Tags Die. Attach the two tags with gingham ribbon and place in the stamped pocket. Cut out the largest tag with the Album Tags and Accents Die in Dark Blue paper and the second largest in the blue plaid paper. Stamp the sentiment from the Just For You Sentiments Set in black on the small yellow and blue print from the paper pad and cut out with the Album Tags and Accents Dies and cut out the scalloped frame from the same set in white. Adhere all the layers of the tag together, add buttons and rose as shown in photo. Stamp the Thinking of You sentiment from the Hand-Stitched Accents set in black on white cardstock and cut out with the Ornamental Tag Die. Cut out a frame in blue paper from the paper pad. Adhere leaves, sentiment and flowers as shown in photo.